South African intelligence picked up clear signs that Fapla was building up forces in the 6th Military Region at Cuito Cuanavale early in 1987. 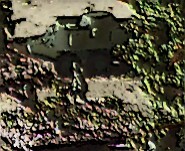 Daily shipments of equipment from the Soviet Union increased Fapla’s overall tank strength to over 500 and included T-62 and T-55 tanks, BMP-1 infantry fighting vehicles. 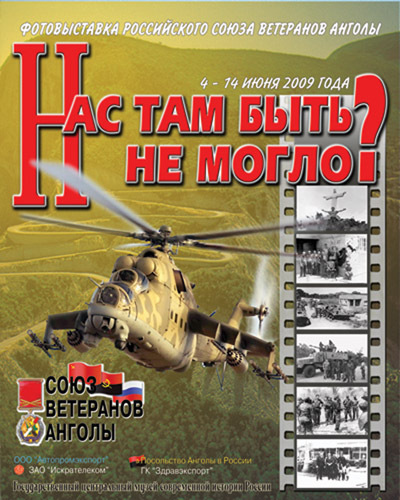 Mig-23 fighters, SU-22 ground attack aircraft, Mi-24, Mi-25, and Mi-35 combat helicopters, and Mi-8 and Mi-17 assault helicopters increased the Angolan Air Force fleet to about 80 fighters and 123 helicopters. 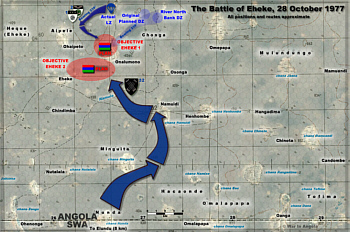 Fapla was concentrating the strongest and best-equipped force yet in the Cuito Cuanavale area, clearly demonstrating their intend to launch a major offensive against Unita’s base areas in south-eastern Angola during 1987. Unita requested support from the South Africans to assist in stopping this offensive, an agreement to this effect being reached on 1 May 1987. 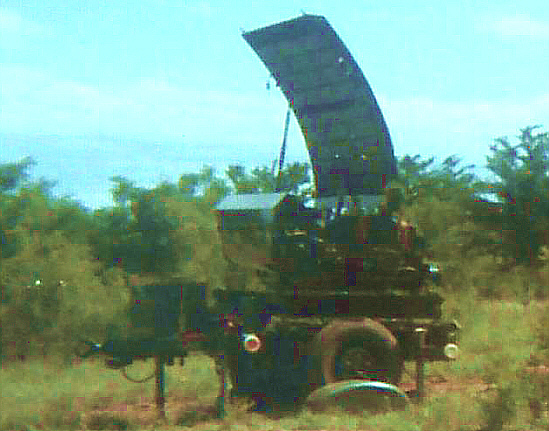 Intending a low-profile intervention with minimum forces, the SADF only initially committed to liaison teams and artillery support on the ground, while using reconnaissance teams and particularly 32 Battalion (a SADF unit formed out of Angolan ex-FNLA guerrillas with white South African officers) for monitoring, delaying and harassment purposes. 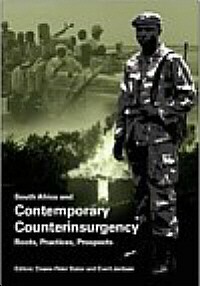 It was soon clear that a significantly bigger commitment of South African forces would be required to stop the offensive. The scene is set for some of the most intense and largest series of battles of South African forces since World War 2! 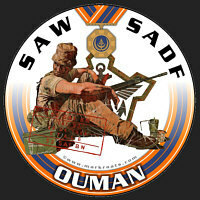 The Chief of Air Staff Intelligence (AS2) of the South African Air Force provided intelligence-based staff services to the Chief of the Air Force and was the second of the six departments and thus numbered as such. The staff functions were all based at the Air Force Headquarters in Pretoria. Dec 1956: The MPLA (Movimento Popular de Libertaçao de Angola) is formed in Luanda from amalgamation of radical nationalist movements (including the Angolan Communist Party) with Ilídio Machado Alves as president. 1 Jan 1959 : Castro's guerrillas seize power in Cuba, spawning Che Guevara's global internationalist mission. Cuba set up contacts with African liberation movements, among them the MPLA (although contacts remain weak at this stage). Major W. Blaauw’s first target eliminated on the morning of 12 December 1975 was the 75mm guns at Kraaltjie. Then it became the turn of the enemy 120mm mortars. Despite being within range of the feared 122 mm multiple rocket launcher, the 140 mm guns scored when all the shells landed within meters of the launcher. By 08h15 the enemy long-range weapons had been silenced. The armoured car troop crossed the bridge without incident, and as part of Phase 2 the infantry attacked and took the enemy positions at Kraaltjie. The armoured cars neutralised an enemy position with six mortars next to the Nhia River, and an infantry battalion deployed in front of the mortars started to flee from their positions in vehicles, one of which was destroyed will all 20 its Cuban occupants. At Bridge 15, the armoured cars drew intense anti-tank fire but fought their way through and destroyed the 75 mm guns. Upon hearing that the enemy was launching a counter-attack with armoured vehicles, the armoured cars were ordered to occupy more favourable high ground, where they were charged by Cuban infantry hiding among the pineapple plants. 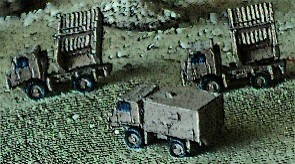 Because the armoured cars had depleted their ammunition, the crews were forced to close hatches and fight off the enemy clambering all over the cars with pistols. As another troop took up position while they pulled back to replenish their ammunition, the attacking enemy armoured cars were driven off by the allied artillery. By 11h45 the UNITA infantry took Koppies. By 14h00 the battle for Almeida was over. Approximately 60 enemy soldiers had been killed for the loss of only two wounded UNITA soldiers. A French missile launcher with missile jointly developed by Somchem, as a low-weight anti-tank weapon with considerable strike effect. A Report of a meeting between a retired South African Special Forces Operator and the Russian Angola Veterans Union. 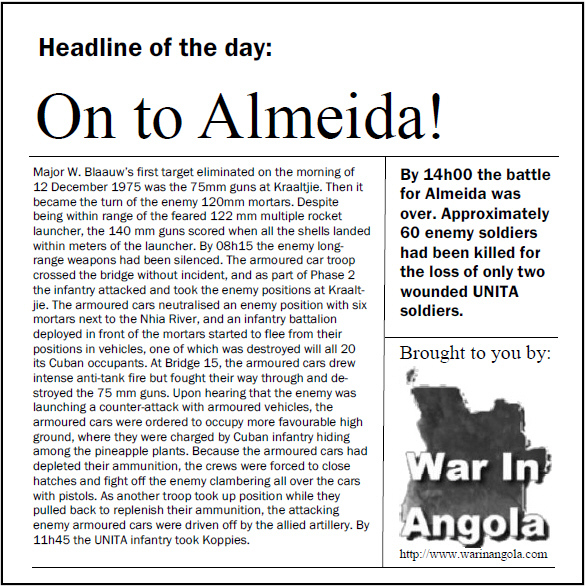 A Geopolitical Report on the Angolan War, including relevant information on the international aspects of the war. A Letter to members of the former SADF from a member of the former PLAN (SWAPO) Special Forces. Поздравляем всех наших русских друзей 16 ноября - День ветеранов Анголы! Congratulations to all our Russian friends on November 16 - Veterans of Angola Day! The above copyright notice and this permission notice shall be included in all copies or substantial portions of any content utilized from this site. THE CONTENT AND INFORMATION IS PROVIDED "AS IS", WITHOUT WARRANTY OF ANY KIND, EXPRESS OR IMPLIED, INCLUDING BUT NOT LIMITED TO THE WARRANTIES OF MERCHANTABILITY, FITNESS FOR A PARTICULAR PURPOSE AND NONINFRINGEMENT. IN NO EVENT SHALL THE AUTHORS OR COPYRIGHT HOLDERS BE LIABLE FOR ANY CLAIM, DAMAGES OR OTHER LIABILITY, WHETHER IN AN ACTION OF CONTRACT, TORT OR OTHERWISE, ARISING FROM, OUT OF OR IN CONNECTION WITH THE CONTENT OF THIS SITE OR THE USE OR OTHER DEALINGS IN THE CONTENT OF THIS SITE. 1. Did you find this site informative?